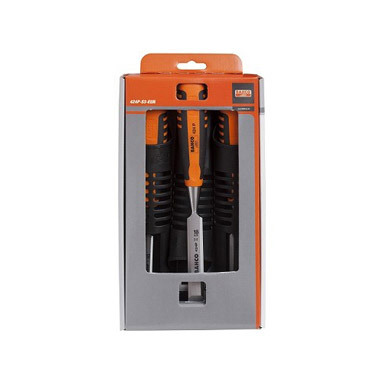 Bahco 424P 3 piece wood chisel set - a brilliant set of Bahco 424P chisels for professional carpenters and woodworkers. This Bahco chisel set features 3 of the highest-quality 424P bevel edge chisels in sizes: 12mm, 18mm and 25mm (1 of each size is supplied). Each chisel has a precision-ground, tempered-steel blade for maximum sharpness and long-lasting performance. The chisels also feature dual-component, shaped handles that help to maximise comfort whilst enabling the user to impart maximum control.